A little over a week ago we packed our little car to ridiculous levels. We each, the lovely Sharon and I, packed ourselves a modest sports bag of clothes and a few books that we believed, naively, we might get a chance to read. The two bags fitted neatly into the foot wells of the back seats leaving the remaining volume of the entire car for the little man’s accoutrements and gubbins. Walker, bath, pram, steriliser, nappies, toys, and two (that’s two!) sports bags full of clothes. 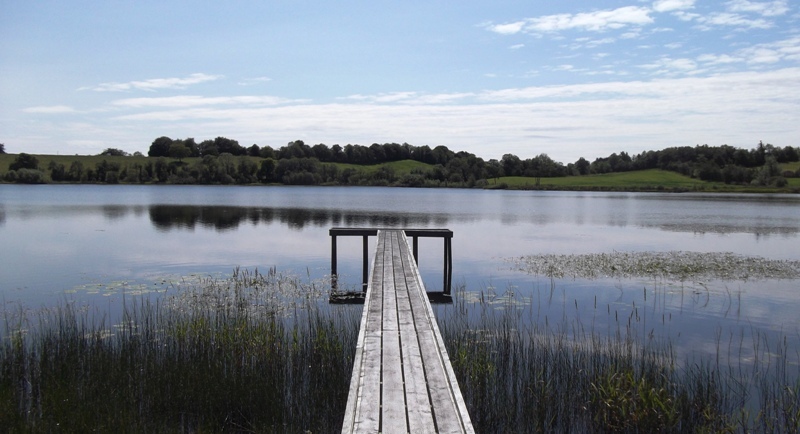 With a heavily loaded car we headed into the heart of Fermanagh for our holidays. Hours of driving later, we arrived in the general vicinity of the house for the week. It was an old converted stable that had been turned into what looked like a lovely self catering apartment. I relied on the lovely Sharon for navigation, and regretted it. In the mountains she is a focused and accurate navigator, taking pacings and timings much more seriously than myself. However, in the passenger seat of a car she takes on a trance like state looking at the hedges and the trees. We usually miss our turn, drive on several tens of miles, before she comes round and insists that our turn-off should be coming up soon. Prior to leaving on our holidays she informed me that she had looked up the web site and committed the directions to memory. Inside my mind I was already shaking my head. Things went reasonably well until we got down to the fine details of finding the stables. As we passed an old wall Sharon came alive with enthusiasm that the directions mentioned a stone wall. This sounded encouraging until she said the same thing about a primary school, an old tree, a church, a lake (there are a lot of lakes in Fermanagh), and a hedge. She was clutching at straws and I knew that, from that moment on, our holidays would rely on blind luck. There were not many people about to stop and ask directions. After driving past one particular house several times we spotted a beekeeper tending to his hives and decided to stop, admit defeat, and ask advice. The lovely Sharon headed up the drive of the house to face the beekeeper. The little man and I were left in the car wondering if we would ever find our home for the week. As time began to pass the little man began to protest quite strenuously at his confinement in the car and I began to wonder what was taking so long. The time taken to discuss directions had passed and I began to wonder what they could be talking about as I watched from the bottom of the lane. It turned out that the house we had stopped at was actually our destination and the topic of conversation had turned to bees as the beekeeper was in the process of catching a swarm from one of his hives. The weather was brilliant for our week in Fermanagh. We did the usual thing of the big parks and gardens. 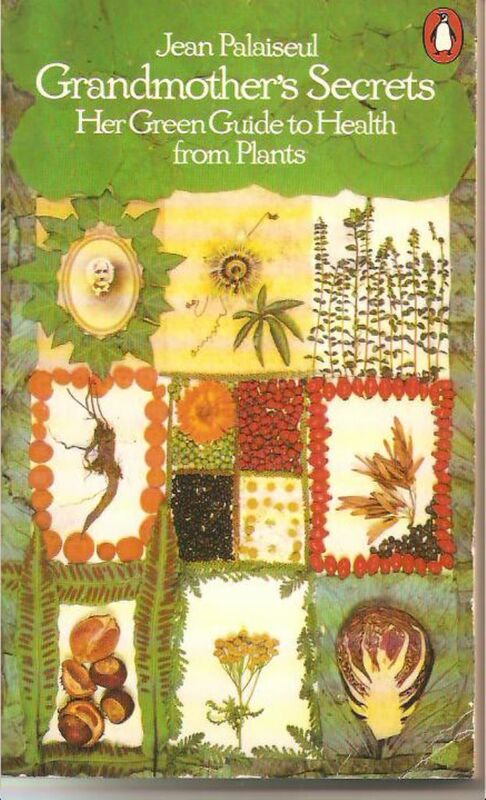 In the evenings we put our feet up in the garden and listened to the plants grow as we read our books. It was a mostly relaxing holiday if you subtract the worry and stress of the little man having a throat infection and suffering a high fever for three nights in a row. A trip to Enniskillen Hospital was called for on one evening to get a diagnosis and some antibiotics. We are told that this is all just part of normal parenting. When we arrived back at the cottage yesterday we found our own little garden had moved on without us. There is another crop of blackcurrants ready to be turned into jam and a large crop of broad beans that needs to be eaten. Tonight we dragged out the cookery books for inspiration. On broad beans we believe that Nigel Slater seems to have the upper hand and we have made a wee list of herbs and cheeses that need to be purchased over the coming days. After our brief holiday in a house that had a massive vegetable garden and a cockerel, chicks and chickens, we are inspired to move along with our own chickens. We are pondering the idea of making a permanent area for chickens and possibly rearing our own for the plate. It is an idea that is not for the present, but maybe for next year. We have an eye on an area below the old beech tree and an empty shed that could be converted into a nice coop if it can survive being moved. This evening I had a look at the hives. As I leant down to listen to one I could hear a very un-bee-like sound. A scratching could be heard above the soft whisper of the bees. Could a mouse have taken up residence? It is possible, but my understanding was that mouse guards did not need to be added to the hives until September. We hope to inspect the hives properly tomorrow and find out what is going on. As I walked over to the other hive at the cottage I thought that nothing could surprise me more than the scratching until I looked at the front of the second hive. A small number of bees had decided to collectively form a plug at the entrance. I had read about this happening several times but have found no satisfactory explanation. 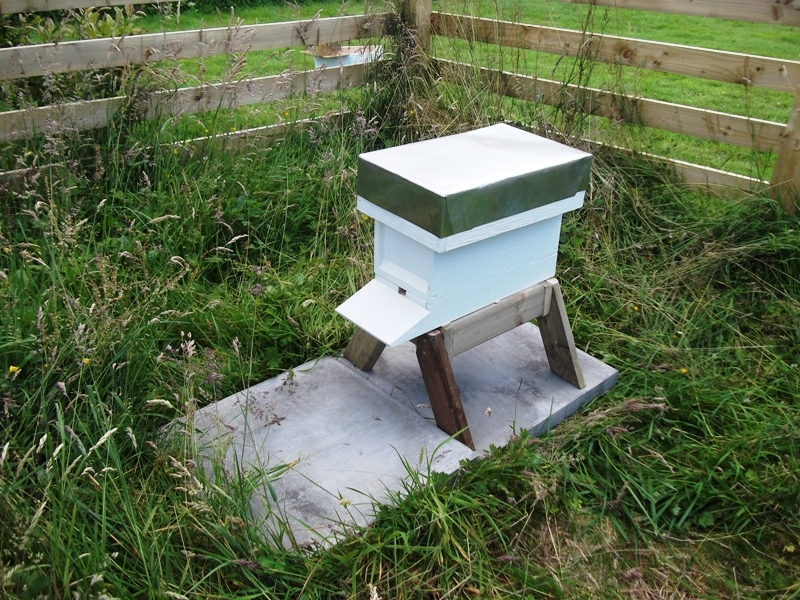 Living space could not possibly be the issue as we added a super box to the hive just before we left for our holiday. It is a little mystery that is fascinating, unusual and strange. Today I lifted the lid on a beehive and did not expect much. I expected a queen less hive or a hive with an un-mated queen. The numbers of bees started at a healthy number which raised the first eyebrow for me. Then, as I shuffled through the frames, I discovered that they were full of baby bees in all stages of development including a lot of sealed baby bees. The pattern of laying was textbook perfect and was a sign that we have a new queen at the cottage. Thought will now have to be put into the naming of her and we are curious what her offspring will look like and behave like. 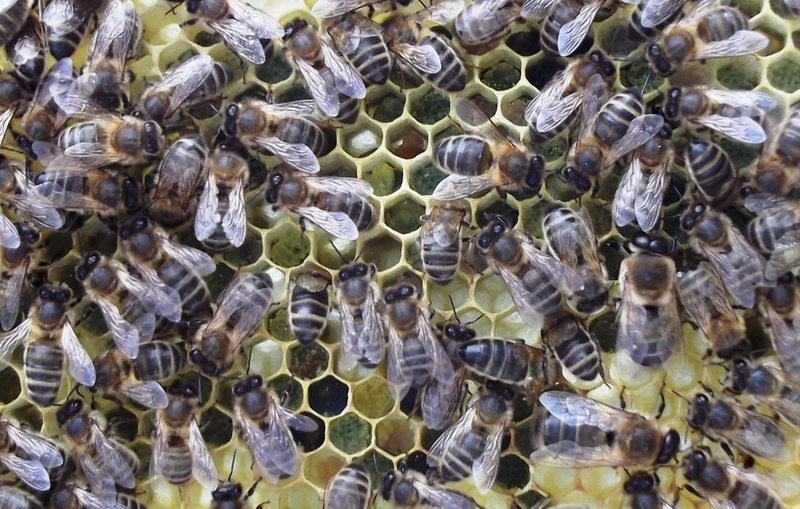 If our new queen has mated with non native bees then her offspring could end up as all sorts. Time will tell. The new queen had not only demonstrated her health but she seemed keen to make an impact in the hive. She had filled a lot of frames with baby bees. Even more frames were filled than her mother Grelder is working on (I inspected her today too). My philosophy for beekeeping is; prepare for the best but expect the worst. So although I was more than pleasantly surprised at the new queen and her work, I was ready for the best possibility; I had prepared a super of fresh frames ready to put honey into. With the super in place I left her in peace just as one of the bees stung me on the knee. After the high I had to deal with the low. 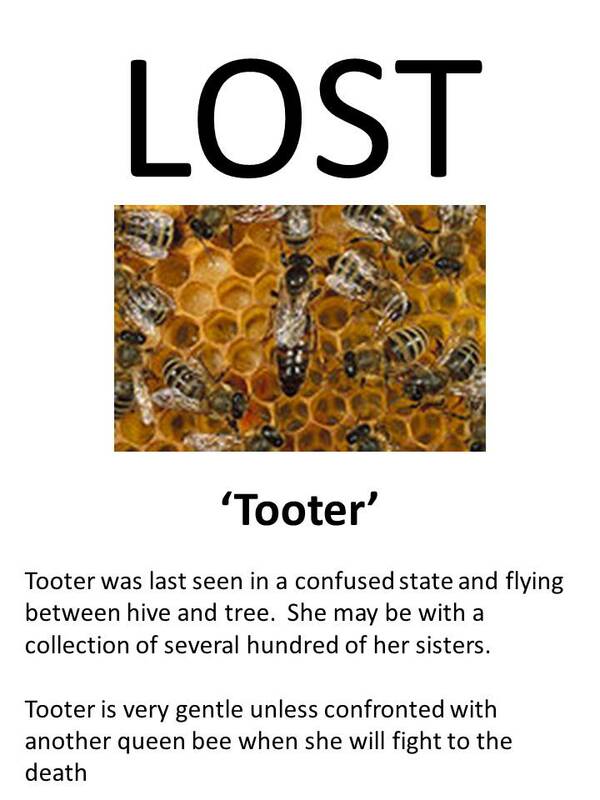 The hive which housed Tooter before she ran away had no signs of a mated queen. 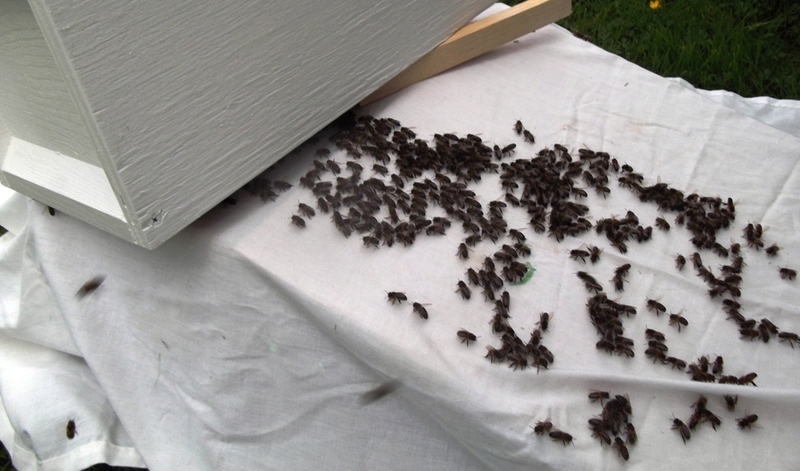 I had a small nuc ready to put them into but the numbers of bees seemed a wee bit big for the nuc. Instead, I removed a few empty frames and slotted in a dummy frame to reduce the space they needed to heat. This little hive will need a couple more weeks to see if anything develops. Time will tell. In the early hours of this morning I was standing at the gates glancing up, then down, at the gates, and then back at the sky again. The wooden gates were in desperate need of a coating of rich preserving and restoring paint but the weather was not conducive. It will never be conducive in Northern Ireland. Instead, brute force and ingenuity where required to overcome the drizzle. Ten minutes later I found myself back at the bottom of the lane armed with a trolley jack and a piano trolley. Removing the massive gates required more limbs than I felt I had, but I managed by holding a gate in the curve of my arms and jacking the trolley jack up with one leg. Thankfully no one drove past to observe the spectacle. Once the gates were transferred to the cover of the garage the painting began. I started painting and got as far as half of one side of one gate. Then the lovely Sharon took over as she knows how much I despise painting. I would consider myself a reasonable handyman but I will also admit that ninety percent of any painting done in our house is done by the lovely Sharon, I am useless at it. The weather dried up but the sky did not clear, but it was dry enough for me to clean the chimney. I have a set of poles that I mostly use to clear drains around the cottage. I used to use them to clean the chimney annually in our old house. It was a conventional open fire and therefore the job was a straightforward and messy one. One of us would shove the brush up the fireplace while the other manically shouted from the garden, “it’s out, it’s out”. However, we now have a wood burning stove. There was no way around the problem, the brush could not be shoved up the chimney. No, for a wood burning stove the cleaning is done in reverse and the brush is pushed down. This is why I found myself with my climbing harness on and attached to the chimney stack by a daisy chain of climbing slings. The view was distracting and the air was filled with the smell of soot and the remnants of wood smoke. For a moment I considered trying a method of cleaning from the Edwardian period which involves dropping a chicken down the chimney but then I thought better of it. After filling half a bucket with soot debris I threw myself into the endless collection of odd jobs that always needs to be done. Hanging curtain rails, hanging mirrors, coat hooks, picture frames and the building of toy boxes for the little man. I downed tools and the weary Sharon left the gates to dry in the garage overnight while we made another batch of blackcurrant jam. I had a dream of preserving raspberries in jars of syrup with a touch of brandy and a leaf of basil. I thought this would have been quite a singular character to add to our preserves collection. My dream was dashed when I went out to collect the raspberries. We had left it too late and the majority of the ripe berries were way past over-ripe and were ruined. This was simply bad husbandry on our part. We had grazed on them for weeks with the mind to pick the lot but never quite got round to it. What I did collect was nowhere near the kilos that I needed to make the process worth my time. The rest of the crop is now half rotting and will feed the birds and insects. Unforgivable. The strongest of the two bee hives here is now bringing in lots of pollen. This is a hopeful sign that warrants further investigation tomorrow. I also hope to visit Grelder out on her banished land, weather permitting. The fire is now crackling and a glass of red is in hand. The lovely Sharon has just volunteered herself to go and shut the gates. She chuckled while she said it and it took me a few seconds to figure out why. The last few days have included experiment in camping, the loss of some bees and a few books. We headed off on a mini holiday towing a trailer tent that had been kindly lent to us. The point of a two day trip was to see how the little man would cope with camping, or this is what we told everybody. The truth is that we wanted to see if we would cope taking the little man camping. It turns out that we must have chosen the best possible two days that the misty isle of Northern Ireland had to offer. The sky was pure blue and we felt like we were camping in the south of France. The little man coped perfectly, as expected when you consider that he had his mum and dad’s full and undivided attention without the distractions of home. After his bed time we would sit outside in the long evening light and sip wine and nibble cheese while we read our books and talked nonsense. The actual location of the holiday was a strange one. We rang round most of the camp sites in Northern Ireland to find them nearly all unsurprisingly booked up. The one place that had a cancellation for only a couple of nights turned out to be a fantastic site in Cushendun. It is an extremely small little village that is both beautiful and full of character. On the first evening we sat outside the tearoom and watched a man pass by with his lawnmower running, appearing to mow the tarmac footpath. This was the moment when I knew that I would like Cushendun. On returning to home after feeling a little relaxed and sun-kissed we unpacked and put our feet up. After a much needed coffee I took a walk around the cottage and decided to check out the bees. On the day before we left I caught a cast swarm from one of the hives (my own fault for leaving two queen cells). I had hived them in a small nucleus hive and hoped for the best. After leaving them for a couple of days there was no activity at the entrance to the nuc. It was raining so it might not be a bad sign. I was itching to know if they had stayed but could not open them up and disturb them unnecessarily. So, the logical conclusion was to grab the stethoscope from our hypochondria kit and try and hear some activity. All was silent. I cheekily gave the hive a little knock which would normally (I have done it accidentally) give a menacing snake like hiss. Nothing. The hive was empty and removing the lid confirmed that it was bare and Tooter and her tiny entourage were gone. Maybe she returned to the hive or took up residence in the other hive that might be queenless. These are extremely slim possibilities but not beyond the realms of possibility. In a week I will get a chance to open up the hives and find out what is going on in what is left of them. Some good news reached me today though. 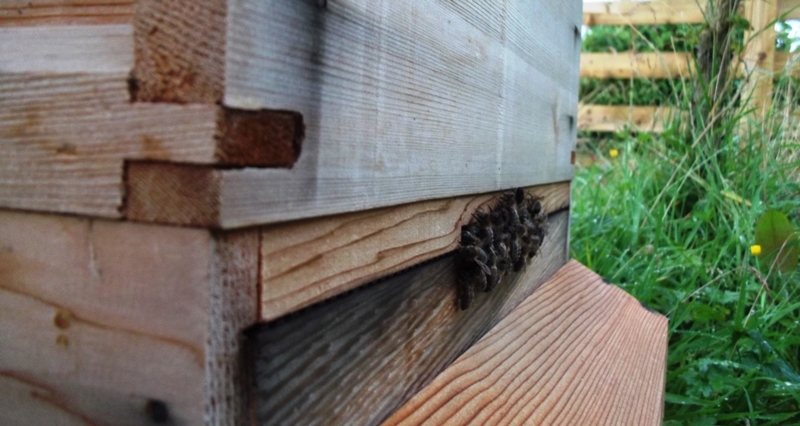 I am told that there is plenty of activity at Grelder’s hive at the out apiary. In theory, she should have a fresh batch of newly hatched bees freeing up even more to be out foraging. Her bees are making honey and they might not eat it themselves if the fine weather returns. Before we knocked off, the remainder of the rick had to be covered with an old tarpaulin which we dragged out of the stable close by We unfolded it gradually, and as we did so more than one nest of mice came to light, mice large and small and tiny. They began to try and-scuttle away, the baby ones running round helplessly. Arthur grabbed at them with his enormous hands, catching two or three at a time. He squeezed them to death and stuck them in his waistcoat pocket. He disposed of a large number of them in this manner. 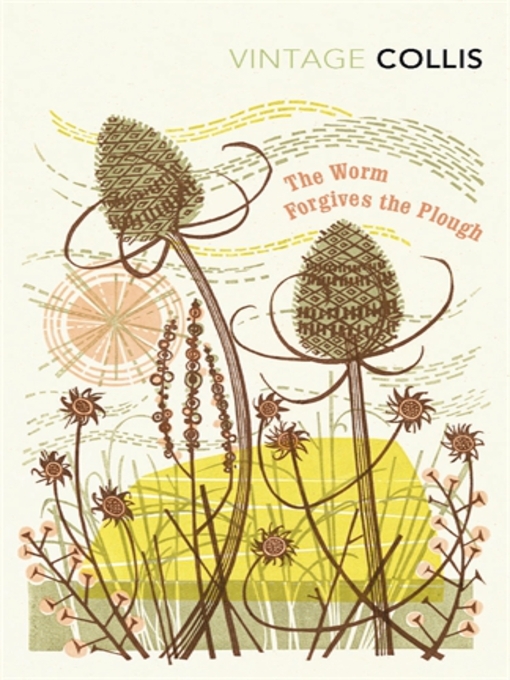 He took a mouse, squeezed it between his forefinger and mighty thumb, stuck it in his pocket, then grabbed another, squeezed it and likewise tuck it into his coat or waistcoat until he was bulging with mice. At first I couldn’t imagine the object of this collection. It turned out that they were for the cat at home. On returning he would call the cat to him and steadily produce mice from his person. Not so much for love of the cat, I gathered, as in order to encourage further research in this direction. Although there is this book and others in the same ‘too read’ category, I could not resist picking up a few more today. There is a second hand book shop in Belfast that is an Aladdin’s cave of treasures that are waiting to be discovered. The shelves seem dangerously stacked and claustrophobically narrow. 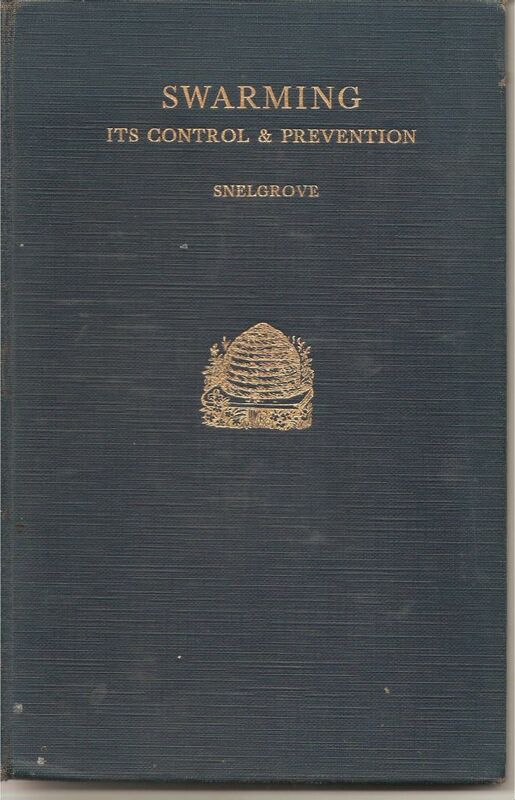 They seem to contain material on any and every subject apart from beekeeping. 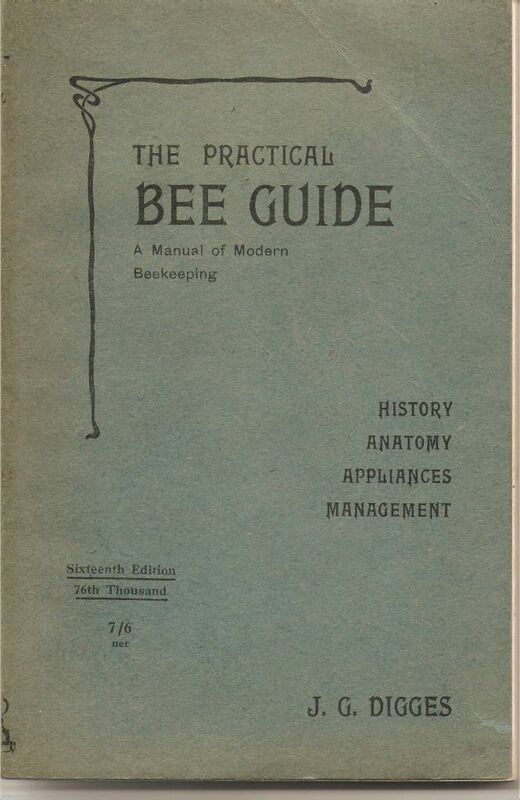 I could not find and section on beekeeping. I enquired at the desk expecting the gentleman to scratch his head and point me towards the natural history section which I had already went over exhaustively, several times. Instead, and to my surprise, he turned around and put hand to a modest pile of books beside the till. 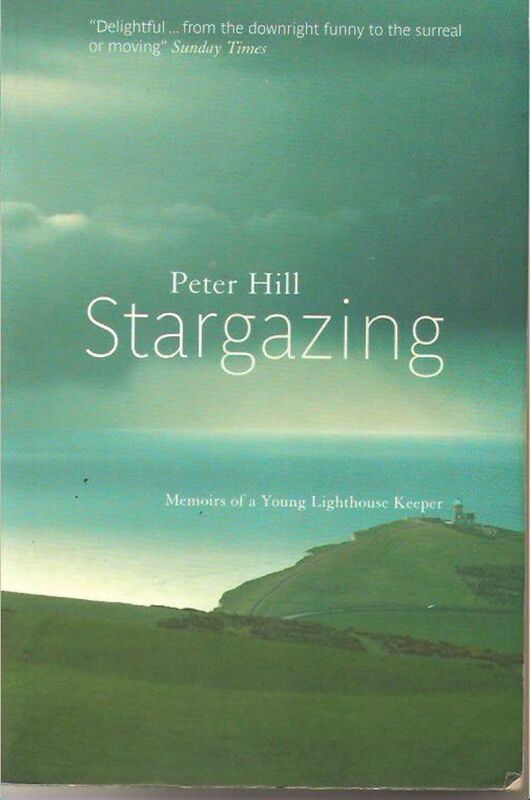 He said that a lot of people ask about beekeeping books and he hardly ever gets any in. So when he does have some he keeps them beside him so he can easily get at them. The books were from a very old collection and one classic stood out so much that once I saw the author’s name and the bargain price. I snapped it up without even looking inside the cover. I walked away with four books for not much more that ten pounds, books that will be added to ‘that’ pile. Ok, take two of the cast swarm. Yesterday I must not have caught the queen. She must have then got spooked and returned to her hive. We heard her tooting again last night. This time have built a little prison for her in the form of a brood box – queen excluder – nuc box. there are two frames of foundation in there to get started on. I think I will leave them like this until tomorrow when I will break it up and pop a couple more frames and an insulated dummy board in. My next project will have to be a frame feeder. As part of the very small swarm that I attempted, and failed, to catch today I noticed green pollen. 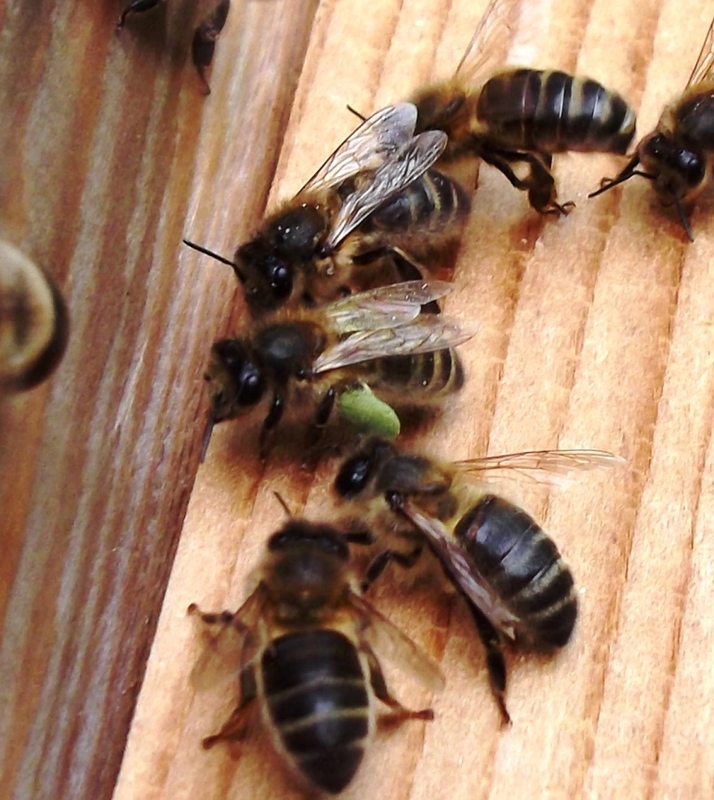 Later on I noticed the same green pollen being brought into a hive and curiosity got the better of me. I suspect that it is the pollen of meadowsweet. 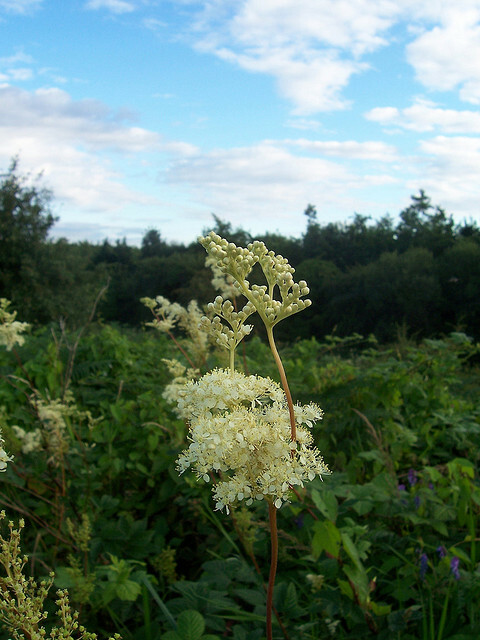 Meadowsweet is flowering in beautiful creamy patches along the hedgerows at the moment. The hedge was in a desperate need of a trim today. In truth, it has been in desperation for a month or so now but I have had little inclination to do anything about it until today. I decided to get up nice and early before the lovely Sharon and the little man even dreamt about waking up. The sleepy Sharon was a little shocked when she woke up and looked out our bedroom window to see me in the garden sitting listening to the morning birds and eating my eggs and soldiers. An hour later I was driving the, still sleepy and breakfast-less, little man to nursery. The day was just beginning and there was a lot to be done. I threw myself into the hedge cutting, not literally. For the first half hour I found myself trying to get daisy chained extension leads to work. These leads would not pass any health and safety inspection but needs must. 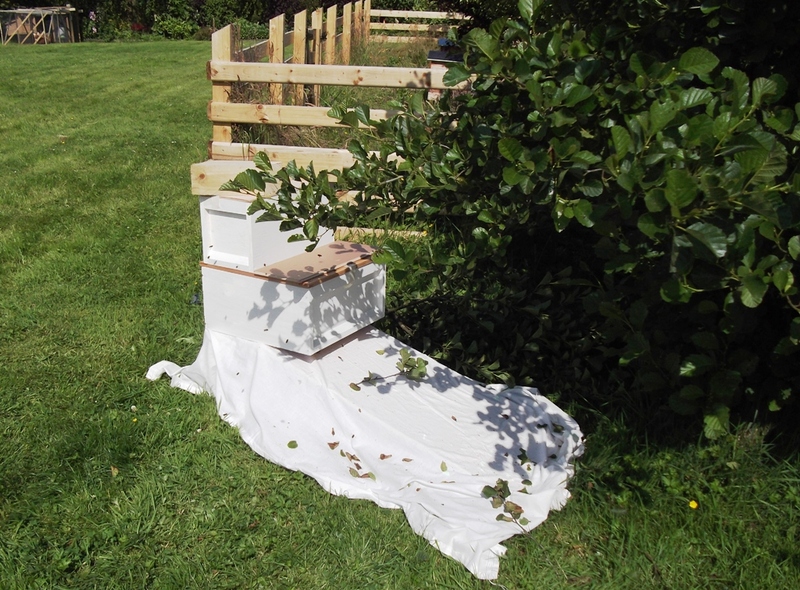 Eventually I worked my way along the hedges and left the hedge along the apiary untill last. It was at this point that one of the day’s little issues began. I sat and watched a growing crowd of bees leave a hive and become more and more excited. This was a hive in which I had left two queen cells instead of leaving one queen cell. It was also the hive from which we have heard tooting every night for the last three nights. It seems that the queen that emerged first wanted to swarm and leave the hive. The lovely Sharon and I leaned ourselves against our hoe and brush shafts respectively and relaxed by watching the amazing site that is a swarm of bees. The straight blurry lines of the scouts navigating and guiding the swarm could be clearly seen. It eventually settled on a low down beech branch. Due to the complete lack of numbers in the hive the eventual swarm paled in comparison to the swarm that left a couple of weeks ago. With a lot more calm and decorum that I displayed with the swarm a couple of weeks ago, I began to collect my bits and pieces from the garage and suited up to ‘catch’ the swarm. I shook most off them into a nucleus box and let the rest walk into the box. We left them to sort themselves out while we dealt with the day’s other issue; jam. The fruit is ripening and must be used before it over-ripens or gets eaten by the birds. 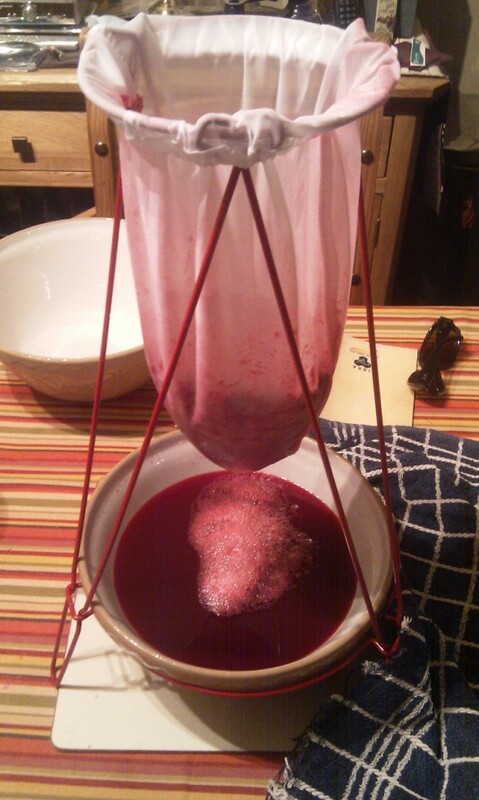 We started a few days ago with blackcurrant jam and then went on to gooseberry jam. Today we picked the redcurrants with the intention of making jelly. But we have run out of jars. We hunted high and low for jars. We also hunted for the jelly strainer that we eventually found hidden between books in the study, no one knows why. Eventually we found a collection of very small jam jars that I had been hoping to use for honey. I had saved these little jars because our honey harvest will probably be low if we get any at all, especially if they keep swarming instead of filling their hives with nectar. The strange thing is that a lot of people are probably expecting samples of our honey and so the tiny jars might have helped us with this dilemma of etiquette. But, again, needs must. The swarm box was now very quiet, too quiet. 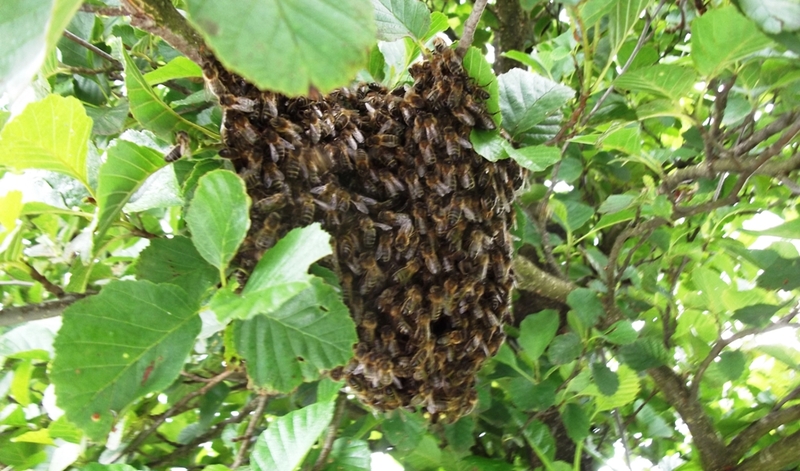 I had noticed that the hive they swarmed from had shown plenty of activity just after I ‘caught’ the swarm. Opening up the swarm box had confirmed my suspicions; the box was empty. Moments after I tried to catch them they were called back to their hive by the fanning of pheromones.